The third release in The Macallan's wood-focused Edition series saw master perfumer Roja Dove and master whisky maker Bob Dalgarno create a whisky using their very particular sets of skills. Dove pinned down the flavour profile for Edition No. 3 by using the same formula he would for a perfume: pinpointing complementary aromas, and balancing these with a “counterpoint” note. The resulting liquid is a combination of six American and European oak casks, with deliciously sweet, floral notes up front. Nose: Reminiscent of a fine fragrance, the nose leads with vanilla ice cream, fresh cut oak and delicate florals. Orange oil provides subtle grandeur while ginger, cinnamon and nutmeg flit in and out in various guises. Vanilla imparts sweetness, leading citrus fruits forward then allowing chocolate to show. Burnished oak delivers a soft ending. 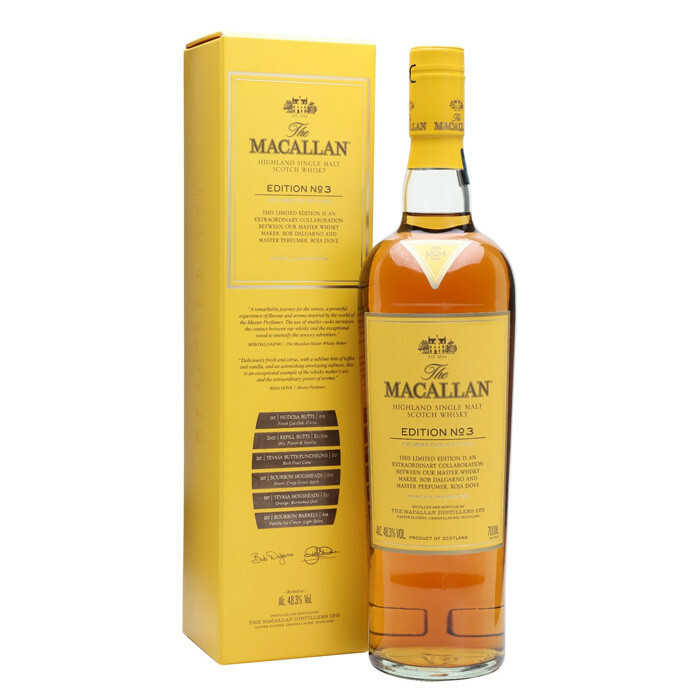 Palate: Sweet fruit, vanilla and rich fruit cake with suggestions of apricot, pear and crisp green apple. Hints of ginger and cinnamon are balanced with a light resinous oak finale. Finish: Long, sweet and fruity, leaving a lasting impression on the senses.